© 2019 Julianne "Julie" Snyder. Limited dates! 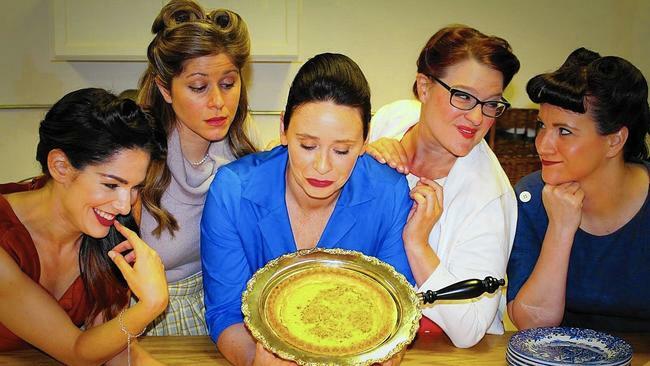 The award winning cast of 5 Lesbians Eating A Quiche (Patrons Pick-Brown Venue, Critics Choice-Best Ensemble) returns for Orlando Fringe Mini-Fest, a 4-day arts festival that presents a hand-picked selection of audience favorites from the 2016 Orlando International Fringe Theatre Festival and beyond. Travel back in time to 1956 and attend a meeting of the Susan B. Anthony Society for the Sisters of Gertrude Stein! You’ll be just in time for their annual quiche breakfast. Will the ladies be able to keep cool when Communist threaten their idyllic community?